From 05 oct 2018 to 07 oct 2018 played 10 games. 4 matches ended with a draw. The most goals 5 was in game (PSG - Lyon). Total goals in this round: 26 goals, in the previous round was 20 goals. A total crowd attendance of 219103 spectators. In previous round 255749. For Toulouse only in Ligue 1 the most goals scored: Max-Alain Gradel 3 goals, Mathieu Dossevi 2 goals. Team the most matches played with formation: 4-2-3-1. Toulouse at home won 2 matches, 2 draws and 1 defeits. 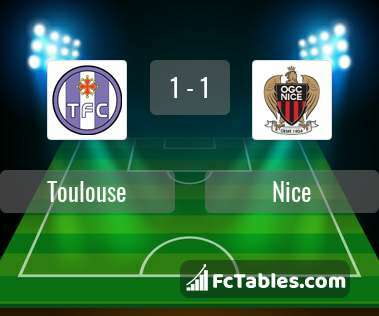 Toulouse scored average of 1.11 goals per game. In matches played at home 1.40 goals per game. In matches played at home an average of 2.60 goals (with opponent goals). For Nice only in Ligue 1 the most goals scored: Allan Saint-Maximin 2 goals, Bassem Srarfi 1 goals. Team the most matches played with formation: 4-2-3-1. Nice away won 2 matches, 2 draws and 1 defeits. Nice scored average of 0.78 goals per game. In matches played away 1.00 goals per game. In matches played away an average of 1.80 goals (with opponent goals). Before the game team Toulouse in table was 7, Nice was: 13. The match ended with the result 1:1. For Amiens only in Ligue 1 the most goals scored: Saman Ghoddos 3 goals, Moussa Konate 3 goals. Team the most matches played with formation: 4-2-3-1. Amiens at home won 3 matches, 0 draws and 2 defeits. 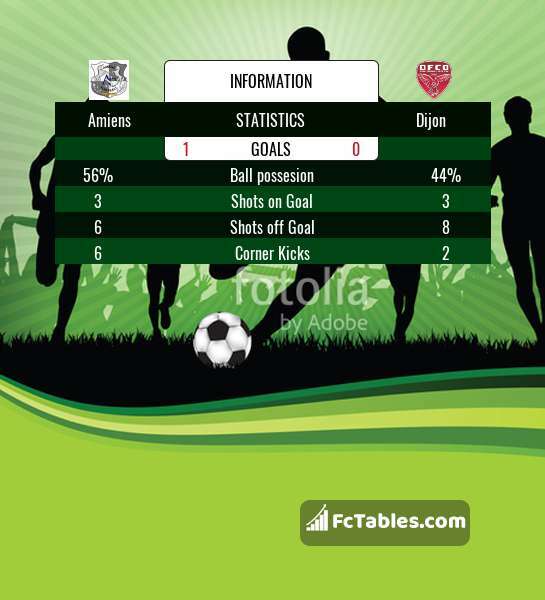 Amiens scored average of 1.22 goals per game. In matches played at home 2.00 goals per game. In matches played at home an average of 3.40 goals (with opponent goals). For Dijon only in Ligue 1 the most goals scored: Julio Tavares 3 goals, Jules Keita 2 goals. Team the most matches played with formation: 4-2-3-1. Dijon away won 2 matches, 1 draws and 2 defeits. Dijon scored average of 1.00 goals per game. In matches played away 1.20 goals per game. In matches played away an average of 2.20 goals (with opponent goals). 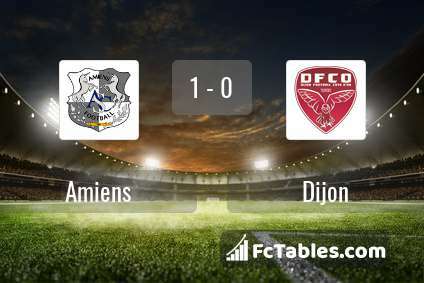 Before the game team Amiens in table was 17, Dijon was: 12. The match ended with the result 1:0. For Angers only in Ligue 1 the most goals scored: Stephane Bahoken 2 goals, Ismael Traore 2 goals. Team the most matches played with formation: 4-2-3-1. Angers at home won 1 matches, 2 draws and 2 defeits. Angers scored average of 1.22 goals per game. In matches played at home 1.20 goals per game. In matches played at home an average of 2.60 goals (with opponent goals). For Strasbourg only in Ligue 1 the most goals scored: Nuno Da Costa 4 goals, Lebo Mothiba 4 goals. Team the most matches played with formation: 4-2-3-1. Strasbourg away won 1 matches, 2 draws and 2 defeits. Strasbourg scored average of 1.78 goals per game. In matches played away 1.40 goals per game. In matches played away an average of 3.00 goals (with opponent goals). Before the game team Angers in table was 10, Strasbourg was: 8. The match ended with the result 2:2. For Guingamp only in Ligue 1 the most goals scored: Marcus Thuram 3 goals, Nicolas Benezet 2 goals. Team the most matches played with formation: 4-2-3-1. Guingamp at home won 0 matches, 1 draws and 3 defeits. Guingamp scored average of 0.67 goals per game. In matches played at home 1.00 goals per game. In matches played at home an average of 3.25 goals (with opponent goals). For Montpellier only in Ligue 1 the most goals scored: Andy Delort 3 goals, Ambroise Oyongo Bitolo 2 goals. Team the most matches played with formation: 3-4-3. Montpellier away won 2 matches, 2 draws and 0 defeits. Montpellier scored average of 1.33 goals per game. In matches played away 1.50 goals per game. In matches played away an average of 2.50 goals (with opponent goals). 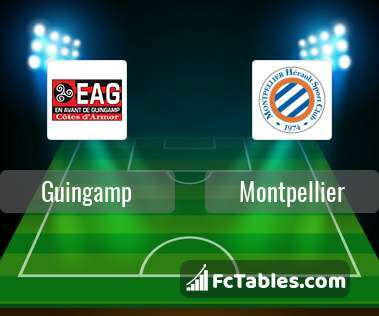 Before the game team Guingamp in table was 20, Montpellier was: 3. The match ended with the result 1:1. For Lille only in Ligue 1 the most goals scored: Jonathan Bamba 7 goals, Nicolas Pepe 6 goals. Team the most matches played with formation: 4-2-3-1. Lille at home won 5 matches, 0 draws and 0 defeits. Lille scored average of 1.89 goals per game. In matches played at home 2.80 goals per game. In matches played at home an average of 3.40 goals (with opponent goals). For Saint-Etienne only in Ligue 1 the most goals scored: Wahbi Khazri 4 goals, Lois Diony 2 goals. Team the most matches played with formation: 4-2-3-1. Saint-Etienne away won 1 matches, 2 draws and 2 defeits. 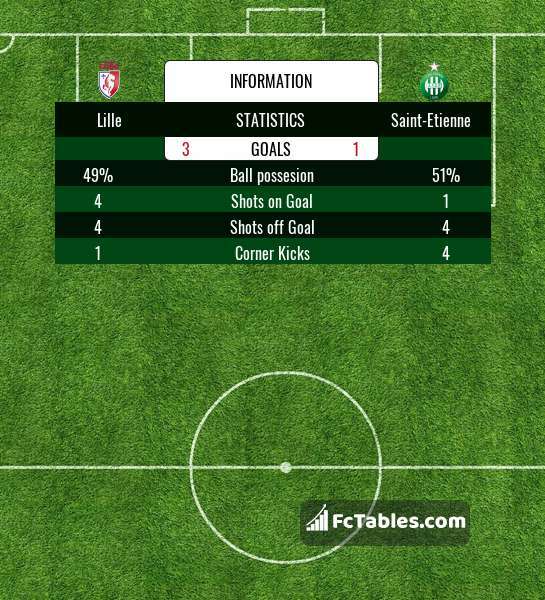 Saint-Etienne scored average of 1.22 goals per game. In matches played away 1.00 goals per game. In matches played away an average of 3.00 goals (with opponent goals). 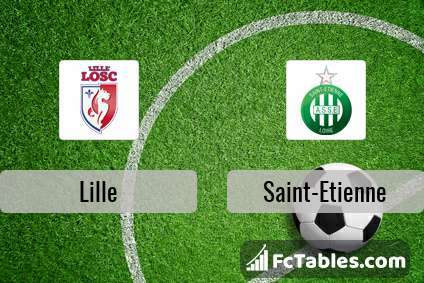 Before the game team Lille in table was 2, Saint-Etienne was: 4. The match ended with the result 3:1. For Nimes only in Ligue 1 the most goals scored: Sada Thioub 2 goals, Antonin Bobichon 2 goals. Team the most matches played with formation: 4-4-2. 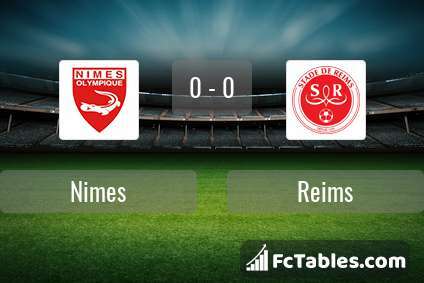 Nimes at home won 1 matches, 2 draws and 1 defeits. Nimes scored average of 1.44 goals per game. In matches played at home 1.25 goals per game. In matches played at home an average of 2.50 goals (with opponent goals). For Reims only in Ligue 1 the most goals scored: Pablo Chavarria 1 goals, Mathieu Cafaro 1 goals. Team the most matches played with formation: 4-3-3. Reims away won 1 matches, 2 draws and 2 defeits. Reims scored average of 0.44 goals per game. In matches played away 0.60 goals per game. In matches played away an average of 2.20 goals (with opponent goals). 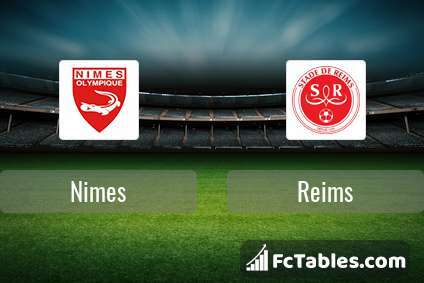 Before the game team Nimes in table was 14, Reims was: 15. The match ended with the result 0:0. For Bordeaux only in Ligue 1 the most goals scored: Francois Kamano 7 goals, Jimmy Briand 2 goals. Team the most matches played with formation: 4-3-3. Bordeaux at home won 3 matches, 1 draws and 1 defeits. 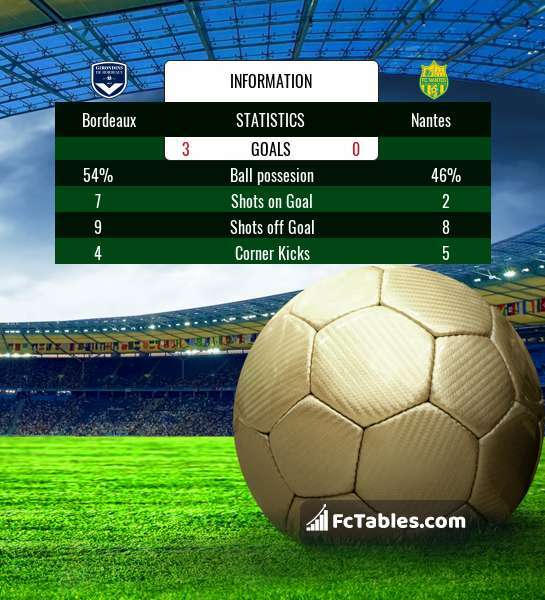 Bordeaux scored average of 1.44 goals per game. In matches played at home 1.80 goals per game. In matches played at home an average of 3.00 goals (with opponent goals). For Nantes only in Ligue 1 the most goals scored: Emiliano Sala 4 goals, Gabriel Boschilia 1 goals. Team the most matches played with formation: 4-2-3-1. 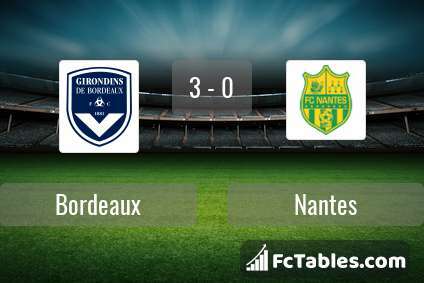 Nantes away won 1 matches, 1 draws and 3 defeits. 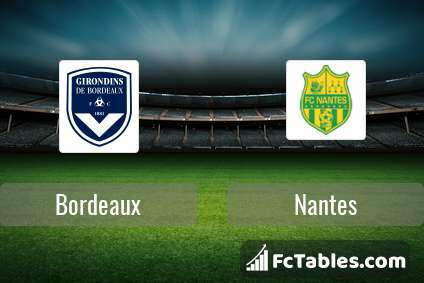 Nantes scored average of 0.89 goals per game. In matches played away 1.00 goals per game. In matches played away an average of 3.00 goals (with opponent goals). Before the game team Bordeaux in table was 9, Nantes was: 19. The match ended with the result 3:0. For Marseille only in Ligue 1 the most goals scored: Florian Thauvin 7 goals, Dimitri Payet 4 goals. Team the most matches played with formation: 4-2-3-1. Marseille at home won 4 matches, 1 draws and 0 defeits. Marseille scored average of 2.33 goals per game. In matches played at home 3.00 goals per game. In matches played at home an average of 3.80 goals (with opponent goals). For Caen only in Ligue 1 the most goals scored: Claudio Beauvue 2 goals, Enzo Crivelli 2 goals. Team the most matches played with formation: 4-2-3-1. Caen away won 1 matches, 1 draws and 3 defeits. Caen scored average of 1.11 goals per game. In matches played away 0.80 goals per game. In matches played away an average of 2.40 goals (with opponent goals). 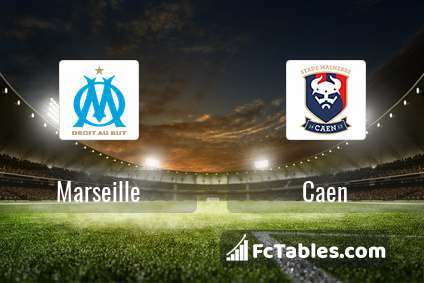 Before the game team Marseille in table was 6, Caen was: 11. The match ended with the result 2:0. For Monaco only in Ligue 1 the most goals scored: Radamel Falcao 4 goals, Youri Tielemans 2 goals. Team the most matches played with formation: 4-2-3-1. Monaco at home won 0 matches, 2 draws and 3 defeits. Monaco scored average of 1.00 goals per game. In matches played at home 0.80 goals per game. In matches played at home an average of 2.20 goals (with opponent goals). For Rennes only in Ligue 1 the most goals scored: Clement Grenier 2 goals, Ismaila Sarr 2 goals. Team the most matches played with formation: 4-3-3. Rennes away won 1 matches, 1 draws and 3 defeits. 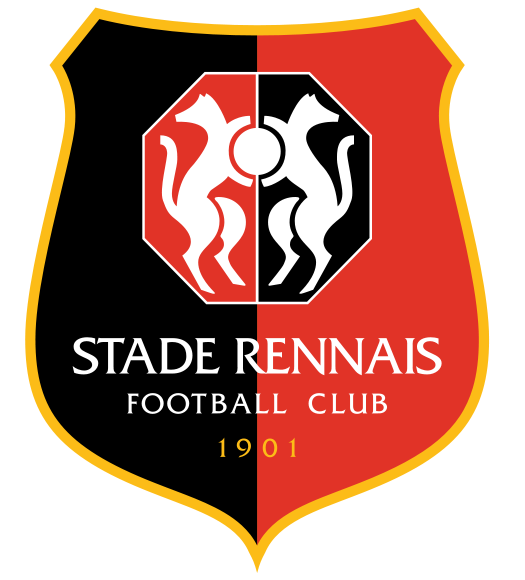 Rennes scored average of 1.33 goals per game. In matches played away 1.40 goals per game. In matches played away an average of 3.40 goals (with opponent goals). 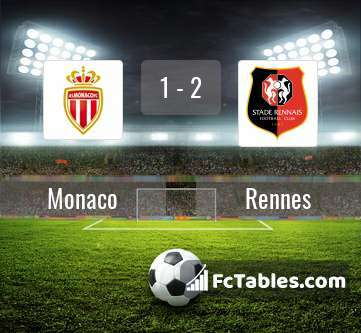 Before the game team Monaco in table was 18, Rennes was: 16. The match ended with the result 1:2. For PSG only in Ligue 1 the most goals scored: Neymar 8 goals, Kylian Mbappe Lottin 8 goals. Team the most matches played with formation: 4-3-3. PSG at home won 5 matches, 0 draws and 0 defeits. PSG scored average of 3.56 goals per game. In matches played at home 3.80 goals per game. In matches played at home an average of 4.20 goals (with opponent goals). For Lyon only in Ligue 1 the most goals scored: Bertrand Traore 4 goals, Nabil Fekir 2 goals. Team the most matches played with formation: 4-2-3-1. Lyon away won 1 matches, 1 draws and 2 defeits. Lyon scored average of 1.56 goals per game. In matches played away 1.25 goals per game. In matches played away an average of 3.25 goals (with opponent goals). Before the game team PSG in table was 1, Lyon was: 5. The match ended with the result 5:0.